I thought it might be fun to check in with my New Years Resolutions and see how I’m doing. At the very least, it might help me feel accountable for sticking to them. Take better care of myself. If I’m being honest, I haven’t kept this at all. I was going to give myself partial credit, but when I read how I actually worded this, I get straight zeroes. The key word here is “better.” I’ve been taking exactly the same care of myself as always. Read every day. Good, I pass this with flying colors. I read three books this month. And, perhaps most importantly, there was only one day when I completely forgot about reading, but my book was sitting out on my bed, so I got a chapter in before I went to sleep. Blog every day. I had anticipated that this would be the hardest resolution to keep. Oh me of little faith. This one has been easy. For proof look no further than my blog archive and the 30 entries in January 2012. I was slightly concerned that giving myself the day off for the SOPA/PIPA blackout would work against me, but I got right back in the habit of blogging. Work on my house. I haven’t worked on this every day, but I have made some progress around the house. I know I could do better, but some is better than nothing. Clearly, I need to continue the good work with reading and blogging and concentrate more on myself and my house. I’m feeling pretty good about reading and blogging. They say that it takes 21 days for a new habit to stick, and if that’s true, then I have two new “sticky” habits. This makes me feel like concentrating on the areas where I need improvement won’t derail me. Well, not an ode, exactly, but I am pretty excited about my new desk chair. 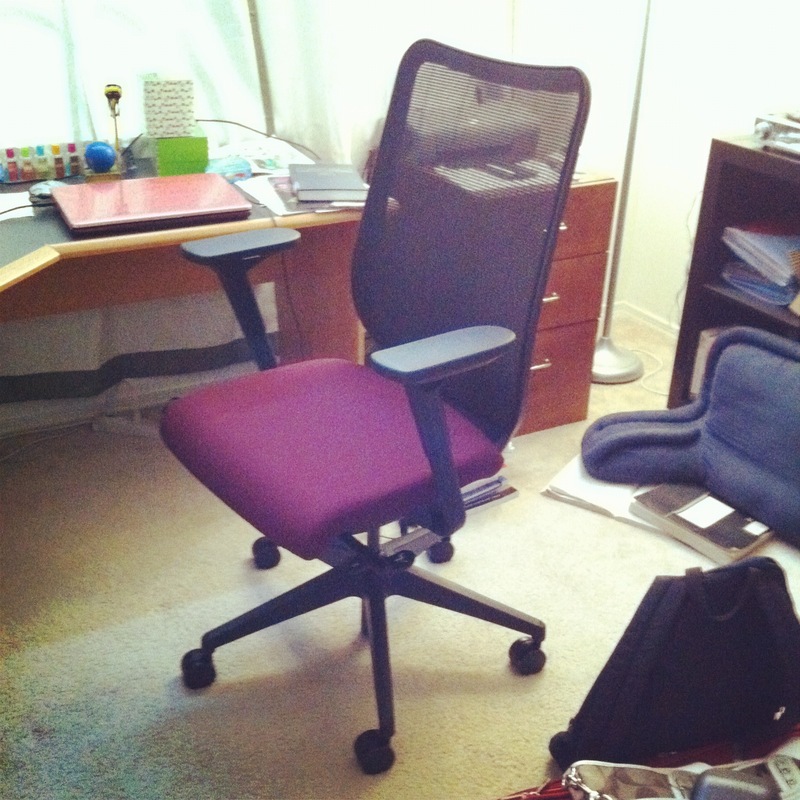 My parents got me my first desk chair when I was in college. It served me well for a decade or so, but I had to put it out to pasture a year and a half ago. 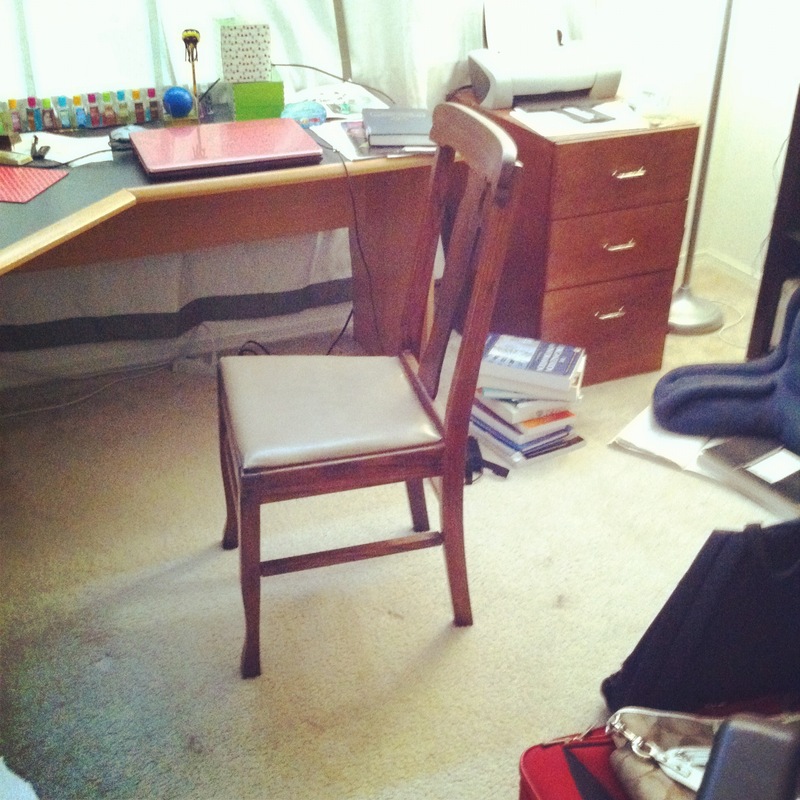 (Here “put it out to pasture” means “leave it in my office as a horizontal space on which to put paper I want to recycle.”) When my old-old desk chair stopped working, I turned to the only available chairs I had: my dining room chairs. It was only supposed to be temporary, but I used a dining room chair as my desk chair for a year and a half. Looks comfy, right? It’s really not so bad for short periods of time. But sitting for hours straight (like for online classes or when writing 15-page papers in two days) was murder. Now that my new chair is here, it can join its fellows in my dining room. So much nicer. It was custom-built to my specifications (!) and has all the latest bells and whistles. (Who knew desk chairs had bells and whistles?) I guess this officially marks the end of Christmas, as this was a Christmas present from my parents. Thanks Mom and Dad! Speaking of my dad, it’s his birthday today. Happy Birthday, Dad! Yeah, I just quoted Milli Vanilli. I’m a little surprised by that, too. Oh well. I do blame the fact that I didn’t get out of bed at 7 this morning on the rain. My alarm went off and I was exhausted, so I hit the snooze button. The next time my alarm went off I was more alert and that’s when I noticed the rain. It was pouring. It was one of those sounds that just makes me want to stay in bed forever (when I was in college I tended to skip my first class on days when it rained for that very reason). I figured I could take another 20 minutes and sleep ’til 7:30. In the end, it was almost 11 by the time I stopped hitting the snooze button. And I still didn’t get out of bed until noon (I probably shouldn’t keep my iPad in bed). Unsurprisingly, I got nothing school-related done today, but that’s okay. There wasn’t anything that really needed to be done. One other thing before I forget. Last night, while I was watching Brand New’s videos on their VEVO page (and after writing yesterday’s post), it occurred to me that if there were finally official versions of their videos on YouTube, then there was a very strong chance that their videos were finally available through the iTunes Store. I checked and sure enough, there they were. I was thrilled and bought them immediately. And I give myself bonus points because the timestamps show that the videos became available on VEVO and the iTunes Store on the same day, December 13. And even more bonus points for correctly guessing that the videos had only recently been added to VEVO (I hadn’t looked at the timestamp before I wrote the post). But I am disappointed that I randomly discovered these things for myself instead of being informed through the band’s Facebook and Twitter accounts. It’s entirely possible that I missed an announcement on both networks, but judging by the small number of views on YouTube, I really don’t think I did. I felt so good about beating technology into submission that I decided to tackle something else and I finally took a first pass at cleaning out my closet. Clearing space in the closet allowed me to attack the pile of clothes that had been building at the foot of my bed for over a year. The pile was approximately 18 inches high and my bed almost looks weird without. But weird in an awesome way. Today I only had the energy to put everything away. Tomorrow I’ll go through the stuff again and cull some more (I have five pairs of black pants, that seems excessive to me). Then I’ll deal with the piles of dirty clothes on the floor of my closet. I’m not looking forward to the laundry, but I am looking forward to getting my closet even cleaner and ultimately being able to give most of the stuff away. I was on YouTube earlier and I discovered that Brand New has (finally) added their actual music videos to their VEVO page. (Judging by the very low number of views each video has, this is a recent addition.) No more grainy video of “The Quiet Things That No One Ever Knows” for me. Although I do kinda miss the Fuse logo chyron in the upper right corner (is that weird?). And if that weren’t enough proof that I win, the Phillie freakin’ Phanatic was on 30 Rock! I wonder if he knew that in the previous episode, Liz Lemon posited that he is biologically female? Doesn’t matter. The Phillie Phanatic was on 30 Rock. Two great tastes that taste great together. Plus, I noticed that Tom Burgoyne, the Phanatic’s best friend, was listed in the credits. Thanks, universe. Today was a good day. Just a quick update so I can give myself a gold star for blogging today. I’ve been having WiFi issues for the past two days. It started shortly after I upgraded to OS X Lion (good job, Apple). I got it fixed last night and this morning I came back from Target to find that WiFi was dead. Again. I wasn’t prepared to deal with the same issue so soon, so I put it off to read some textbooks and then re-watch X-Men: First Class (James McAvoy and Michael Fassbender in the same movie, be still my beating heart). I finally got online through a straight ethernet connection and here I am. The apparent causal relationship (bringing it back to what I read today, go me) between my upgrade to Lion and my WiFi issues did not go unnoticed this morning. The first thing I did when I got back online was google “lion wifi problem.” It appears I am not the only person to have this issue. People have experienced it since Lion launched. Apple, I am disappointed, seriously. Anyways, I’m off to try some of the solutions I found. Wish me luck.